This is the Japanese stringed instrument called "Koto". It was introduced into Japan from China as an instrument of the Gagaku (the court music) in the Nara Period. Usually, this instrument is the 13 stringed type, and has standing ji (kotoji) which are the small bridges under each string that the player can slide to adjust the tuning. To play the koto, wear three artificial nails on the right hand thumb, forefinger and middle finger. Therefore, it is really another instrument with "Kin" which has 7 strings and no kotoji, plays the string by empty handed, hold a position with the left hand. Then there is the koto of 17 strings devised for the low range. This is the instrument devised by Miyagi Michio who was the most famous musician as a composing person ("composer") of "Haru-no-umi". The instrument's parts, for example, the body's entire length, the width, the thickness, the thickness of the string and so on are bigger than koto of 13 strings. 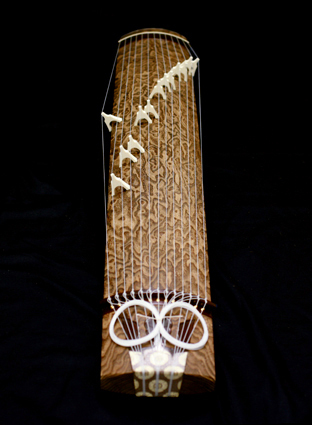 Koto was used to play as a compulsory culture instrument of nobles. After the Kamakura Period, it was transmitted as an accompaniment tool of a song for the temple, and the genre of tsukushi-goto (the older tradition of koto music) was born from there. Besides, that tsukushi-goto as a matrix, the modern koto music which became the origin of koto established by Yatsuhashi Kengyo in the early stages of the Edo Period. That is well-known as an instrument which represents Japan now. The shamisen (three stringed instrument) is one of the stringed instruments represents Japan, surprisingly, its history is comparatively short. It is said that Chinese three stringed instruments "San xian" introduced to the Ryu-kyu- Islands, and comes to be called "Sanshin", then, sanshin was introduced to Japan in the middle of 16th century. In Japan the shamisen was first played by biwa players. It seems that instrument's body (covered by a snake skin) was tore by using the bachi (plectrum for playing biwa). In addition, it was very difficult to get the snake skin for repair it in Japan. Therefore, shamisen's body is covered with the cat skin or the dog skin. One of the great characteristics of the shamisen put out the thickest string called "Ichi-no-ito" from the upper bridge, and it is that the effect of sawari (the effective noise) is devised. The Ichi-no-ito takes out the appealing tone by the effect of sawari. By the pitch, when the midlle string "Ni-no-ito" and the slimmest string "San-no-ito" is played, it is resonant with the Ichi-no-ito, and it can get the effect of sawari. The shamisen is different from kind by played music respectively varies the size of the trunk, the thickness of the pole, the thickness of the skin, the weight of the bridge and the stick, the thickness of the strings, and so on. Broadly speaking, it is divided into three groups; the thickest pole called Futozao, the middle pole called Chu-zao, and slimmest pole called Hosozao. This is the only Japanese instrument to play with a bow. 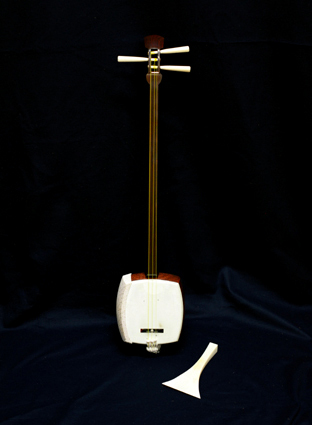 Kokyu's shape is about the same as the shamisen, and it usually has 3 strings. That bow is made of the bundled hair of the tail of the horse. The hair of bow doesn't tighten up straight, adjusts tension by the finger when it plays. 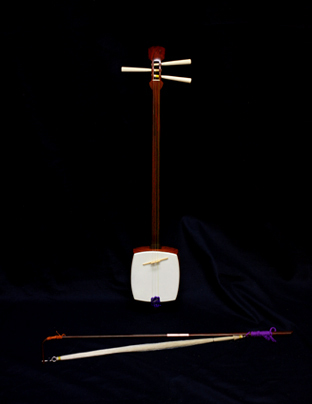 The Kokyu pierces its body with the pole as well as the shamisen, and the pole's top sticks out; that part is called "nakagosaki". The length of Kokyu's nakagosaki is usually much longer than shamisen's one. Playing the Kokyu, set up an instrument to put nakagosaki between knees, and change the direction of the instrument itself on the fulcrum of nakagosaki. MIYAGI Michio made a large size Kokyu to increase the volume of it. That is called "Dai-kokyu". Dai-kokyu's size is about the middle with prevailing Kokyu and shamisen. It is different from usual kokyu that nakagosaki of Dai-kokyu doesn't stick out. Therefore, its appearance is even closer to the shamisen. Though the origin of Japanese Kokyu is not clear, it is confirmed that it existed in the early stages of the Edo Period.